Dear Grandparent, first and foremost, we cannot begin introducing Grand Baby Box before expressing how much we adore and respect grandparenting. As real parents behind this screen, we can’t thank you enough for bringing such a pivotal inspiration, joy, learning and unconditional love to our little ones; and above all, for shaping their lives only the way you can. With this huge gratitude within our hearts, we are delighted to present this very special service to you, from parent to grandparent! Let us explain. 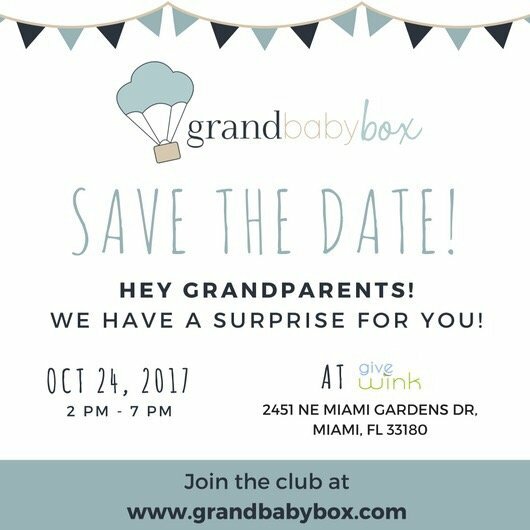 Grand Baby Box is the very first subscription box service that will bring you age and gender appropriate essentials and awesome items to have for your grandbaby, entirely curated by founder and baby product connoisseur Francine Delarosa; also owner of Give Wink, the one-stop specialty boutique store for babies & kids located in Miami, Florida. From bath-time and feeding-time, to play-time and nap-time, we got you covered! With your subscription, our expert team will carefully prepare and deliver your personal Grand Baby Box every two months, straight to the comfort of your home. Inside the box, you will find at least 4 surprise items meant to have a significant impact in the way you relate to your cherished grandchild. Gone are the days of lack of information and impersonal services. The wonderful world of delivery boxes is an exciting and growing trend, and we are delighted to have you on board! We understand how times have changed since you had your own children. We are living in a world full of technological advances and therefore, the way we educate, take care of and interact with the little ones nowadays has also changed. Unless you are a current modern mom, it’s very difficult to keep up with what is needed, what is best or what is useful for your grandchild, and ultimately, what makes them happier. That’s when we show up. Our true mission is to make the best out of grandparenting, one box at a time. With Grand Baby Box, grandparents can now relax, count with everything they need, and actually build the most special, memorable and fun time with their grandkids. We’ll help you achieve that, simply because we know how. They deserve it, and so do you!